Snapchat is growing rapidly and is seeing a lot of growth especially in the college-age market. Since this is our target-demo, Snapchat is a natural fit with us. For those still not on Snapchat, hopefully these stats from our graduation Geofilter will show you the light. The graduation geofilter below is the one we had created in-house by our graphic artist. 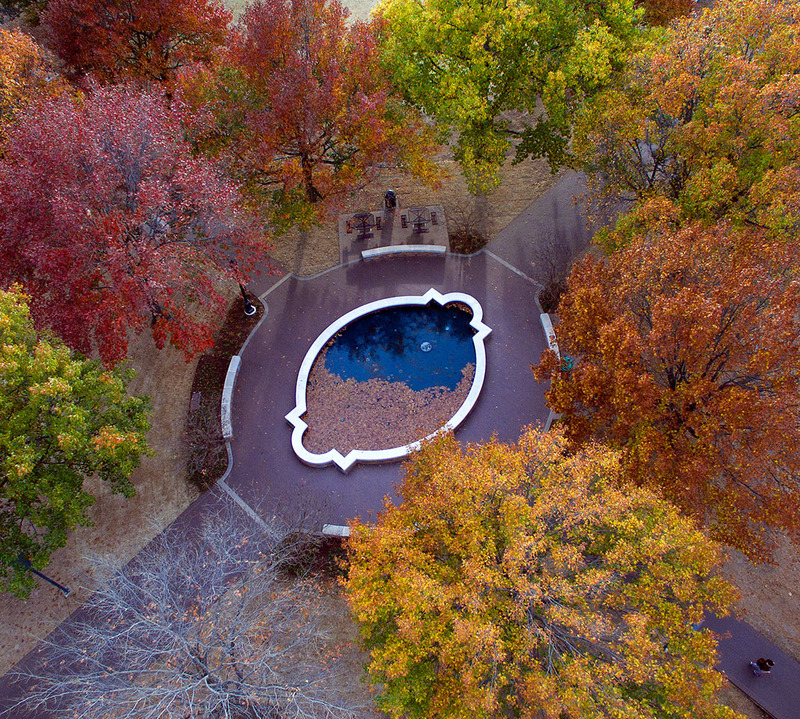 We were sent this image from one of our students to our main “midwesternstate” account. Since Snapchat now rejects geofilters with hashtags, we had to spell out “Mustang Grad” instead of using a hashtag. We also included a date and because it was a paid geofilter, we could also include our official logo. We then added a transparent maroon gradient at the bottom, while putting a streamers graphic at the top. Students enjoyed it. We received a lot of comments about the streamers and we talked to enjoyed the idea. You may need to click the graphic to see all the small text in it. This is the set up we sent Snapchat for submission. It took us two days before they gave us the approval email. We spent $20.95 for four hours from 9 a.m. to 1 p.m. Graduation started at 10 a.m. and ended around 12 p.m. The extra hours were put to give students extra time to use the filter before and after graduation. We also mapped out the Multi-Purpose Event Center and Kay Yeager Coliseum in places we knew students would go, so we didn’t pay extra for space we knew students or family wouldn’t be. This is why the funny shape, but when it comes to saving money, this is the best way to do this. Always eliminate all square footage you know you will not use. For four hours the filter was used 561 times. This equaled 42,946 views or impressions. We used our Twitter account and our Snapchat account to advertise that we had a graduation filter. 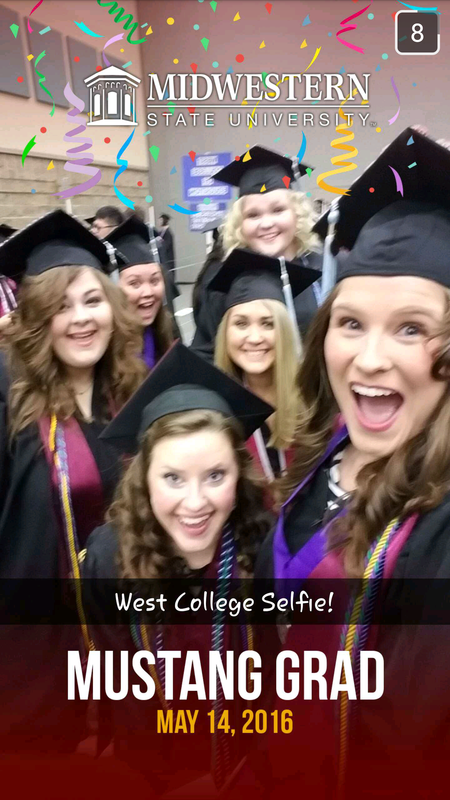 This is the third time we have had a graduation geofilter, and a lot of the students do expect a filter. This is the first time we have been able to track all usages of the geofilter. Some things we did learn from using a geofilter. We need to find another avenue to advertise our geofilter besides Social Media. If users do not follow our social medias, they will not know about the geofilter. 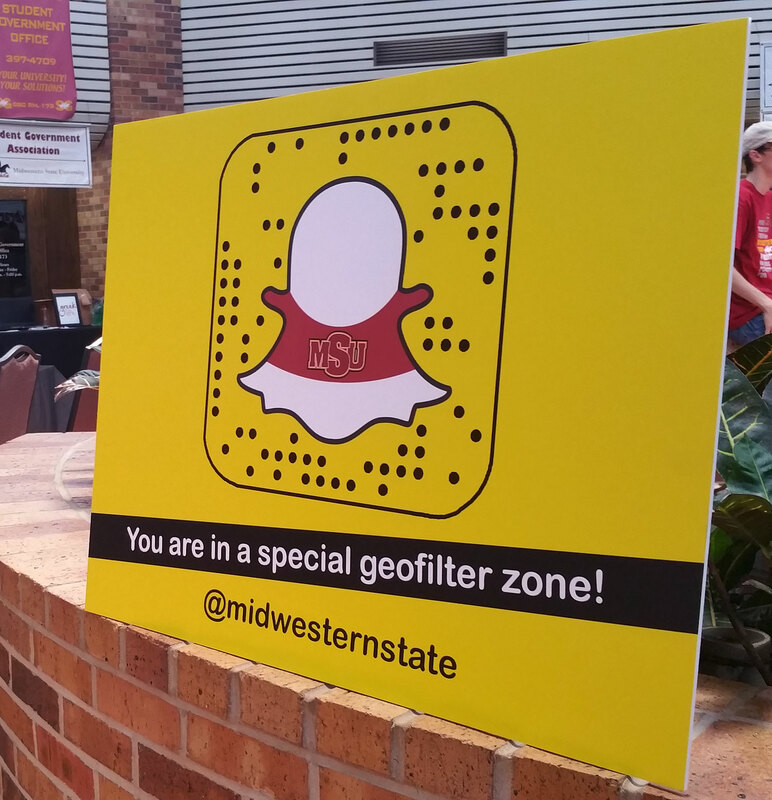 Since then, we have started using the special geofilter zone placards found below. They have helped tremendously! On days when we use geofilters, we see our follower count increase by 20. While the graduation filter was fun, our follower increase was steady at nine. If you are contemplating on jumping on Snapchat, give it a try! It’s a lot of fun and it can really show your creative side. If you have further questions about how geofilters work or Snapchat in general, you can always email me.